Chain #2, including kotetaoshi, maeotoshi, and gyakugamaeate or gedanate. 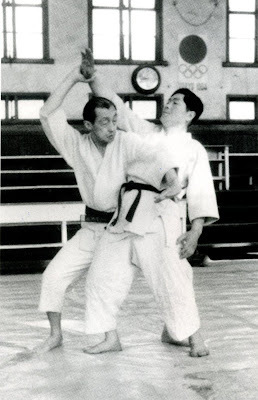 Today I really tried to emphasize the stuff I've been trying to explain here on the blog for a couple of weeks here and here and here and again, here - the difference between the aikido and jujitsu and karate strategies. While a practitioner of any of these arts may certainly choose to use any of these strategies, the three arts characteristically make use of common techniques in different ways. They don't necessarily have to - but they usually do things this way. Karate sets up a strong position from which to preempt or counterattack. Jujitsu flows until a position of superior leverage is attained, then sets up a strong position and attempts to apply superior leverage to defeat the opponent. Aikido is a kind of jujitsu applied with a different mindset. The aiki guy evades, flows, setting up a relationship of superior position and leverage, but then tends to hold that power in reserve in an attempt to keep evading and blending.